Android phones and tablets have a screen orientation feature. It's a must option for users to use the device as per their convenience. For reading ebooks and web pages, portrait mode is useful. For watching movies and YouTube videos, landscape mode is the best. The Gyroscope sensor changes the screen orientation. 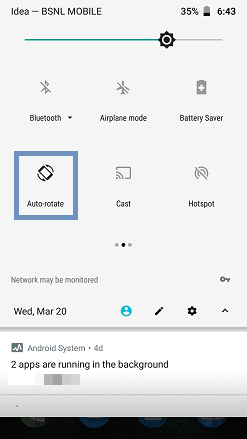 Auto rotate on Android may not be liked by all users. When you want to read an ebook on your mobile, if screen rotates to landscape, it would be annoying. It is the same case when you use your device in landscape mode. Another disadvantage of autorotation is that it will drain the battery life. Some users have reported that Turning ON the auto-screen lock saves 10-15% of the phone's battery life. To control and change screen orientation, you'll have to use the Android auto rotate setting. So, you can rotate the screen manually or automatically. You can do this by using either the in-built setting or a third-party Android app. The third-party apps are useful if auto rotate Android is not working on your device. 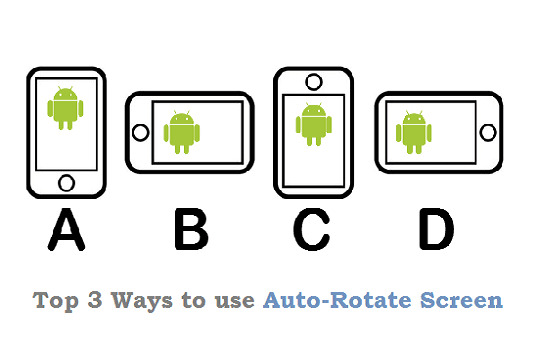 In this tutorial, you'll learn the top 3 ways to enable and disable auto rotate screen on Android. Android Phone or Tablet (v2.3 or above). Auto Rotate Widget app (optional). Screen Rotation Control app (optional). 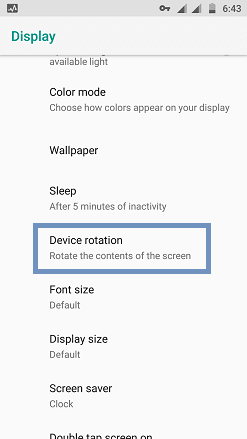 As we discussed earlier, now we'll learn how to enable and disable screen rotation on Android using the in-built functions. Swipe down from top of your screen to see the notification drawer. (You'll see a lot of shortcut options like SIM1, SIM2, Bluetooth, Wi-Fi). Tap on the Phone icon to 'Toggle ON/OFF' between Portrait and Auto-rotate. Long press or hold on the same icon. 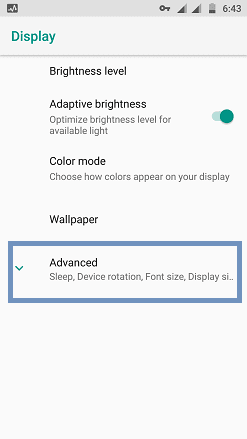 Tap Advanced under Display settings. Alternatively, you can go to Settings app > Display > Advanced. Now tap on Device rotation. Rotate the contents of the screen - It enables the auto screen rotation. Stay in portrait view - It disables the auto screen rotation. Choose the option that you want to apply in the settings. If you want an ON/OFF screen rotation switch on your home screen, Auto Rotate Widget is a nice method to use. Click here to download Auto Rotate Widget app from Play Store. After installing this widget, it won't appear in the app drawer. This widget act as a short cut to built-in screen orientation settings. Hold on the home screen on an empty space. 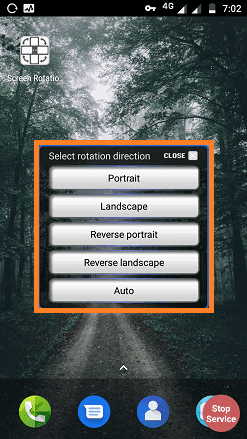 From the widgets pack, choose 'Auto Rotate Widget'. Touch and hold to pick up the widget. Now, you can able to control the auto rotate right from your home screen by using this switch. Go to Settings > Apps & Notifications > App info. Find the widget and uninstall. Is the auto-rotate feature not working on your phone? You should follow the below guide to fix the issue. I'll also explain the additional features in this app. Click here to download this app from Play Store. Place the app on your home screen for your convenience. You'll see a pop-up box showing 5 options. This app gives you full control over the screen rotation. Portrait - Tap this option to read ebooks, web pages. It will stick only to Portrait mode. Landscape - Use this option to watch videos or surf anything in the sideways mode. Reverse Portrait - If you want to tilt the screen upside down, this is the best option you should try. Reverse Landscape - To use your phone on the opposite sideways mode, tap this option. Auto - When you Turn ON this option, you can use your phone in any mode except 'Reverse Portrait'. On the notification drawer, you can see for which option is currently Turned ON. There are two main advantages of this app. You can rotate your home screen and any specific apps in any mode. You can play games like Subway Surf and Temple Run in landscape mode. Launch the app and tap on Stop Sevice which is at the bottom right corner of the screen. There are so many apps and widgets available in Google Play. Some of the best alternatives are AutoRotate Switch, Rotation Locker and Smart Rotate. I hope this helps. If you find this tutorial useful, share it with your friends.